By Jamey Austin, published August 31st, 2015. Using Confluence to document and share customer interviews can help with every step of the process, including the most important, final step: using customer feedback to create brilliant products and features your customers will love. If you're currently putting your customer interview data in a Word doc, Evernote file, or ______ (fill in the blank) and sharing with your team via email, you're in for a treat. We have loads (technical term) of customer interviews documented on our internal Confluence instance, so we thought we'd share our best practices for creating an interview page template. Feel free to make modifications to better suit your process. Remember, Confluence is a canvas to design as you like. Start off with the essentials. Design your page so you can add company and background information where it's easily accessible. You're providing context for your team, so include details about your relationship with the interviewee, the role of that person, and how the interview came to be. Also, make sure to add what product(s) they use. The goal is to capture the critical details at the top of your page so anyone can quickly grasp who you interviewed, why, and what you talked about. The top section of this page is set up to capture the essential interview details we've talked about. It features a detailed title, and company and background sections. Use the Page layout button from the editor toolbar (see screenshot) to decide how you'd like your information displayed. Here a Two column section is selected which splits the page into two equal sections. Add page elements. Select Insert table from the toolbar to add a table like in the above company section and add as many columns and rows as you need. We've inserted a Table of Contents macro (select + button in toolbar > Other macros > Table of Contents macro). This macro creates a list of heading links for quick access to more detailed information. In this example, a list of headings for each problem observed. Note the list of headings created by the macro. The information these heading links are pointing to is described in the next section. The Table of Contents macro creates a list of headings (in this case, each problem title) that link to a specified section where the full details live. In this example, the headings appear where we inserted the macro in the top "Problems Observed" section and link to the detailed information about each problem in the next section. You can configure your Table of Contents macro to grab headings and create similar lists by selecting edit in the macro and completing the necessary fields. Learn more about the Table of Contents macro. Note the Table of Contents macro used in the first section grabbed the headings "Design Capabilities" and "Problem 2 - Problem title," which link users here where the full details of each problem are found. Create a new section (select + Add section from toolbar, then choose Single column section). Our example starts of with use cases. Write a one-line problem statement. Be concise and articulate the user's intention but not their feature request. Note all observations that led you to confirm the problem. Be sure to include screenshots, recordings, or practical examples to provide additional context for your team. Add opportunities you have to solve the problem. Link to related epics, tasks, or feature requests in JIRA (or whatever you use to manage your team's backlog). Once you've created a customer interview page you like, Confluence lets you "templatize" that page so you can use it again and again. Learn more about creating a template. By standardizing your customer interviews with a page template, you'll establish consistency for everyone who conducts customer interviews. The next steps involve organizing, centralizing, and sharing your customer interview information. Labels make searching for customer interviews simple. At the top of the page where your title ends, select the label icon. Add a label like "customer-interview." Boom! You're done. Choosing a standard label for every customer interview helps with organizing all your interviews. After you've added the "customer-interview" label to your page, you can add additional topic labels (product, use case, terminology) at any time. 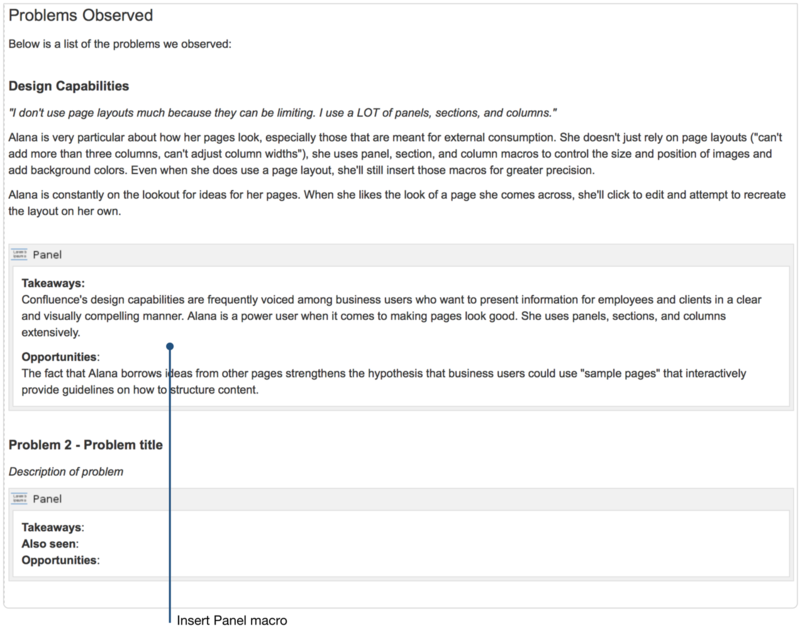 Labels are important in Confluence because they can be pulled into summary lists on an index page via macros. It's a good idea to get in the habit of tagging up your interview pages using labels. This will give you several display options for your index page, like a list of all customer interviews or a list of popular topics. Another great aspect of Confluence is not only keeping your information organized, but also centralized. 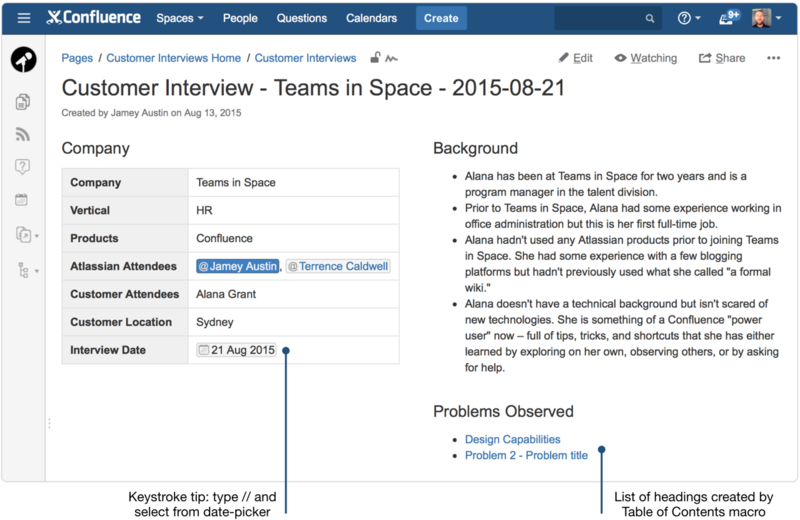 Here are some suggested steps for centralizing your customer interviews in Confluence. It's a good idea to create a customer interviews space and make the home page a customer interviews index page. An index page is great for keeping all your customer interview information in one place. If your team is small, you may not need a dedicated space for customer interviews. But if you have multiple teams, it makes sense to create a customer interviews space and make the home page your customer interviews index page. Either way, an index page is great for keeping all your customer interview information in one place. Important note: this is the home page. Complete the first task by creating an index page (details below), and the index page becomes the home page. Start creating your customer interviews index page! As you can see, the most important information is front and center. You've come to this page for two reasons: you're looking for a customer interview, or you're interested in creating a new one. These two options are at the top of the page, above the fold. Livesearch macro - lets you add a search box, which can be configured to best suit your needs for your index page. Find out more about the Livesearch macro. Create from Template macro - add a button on your index page that opens a page template (like your newly created customer interview page template) when clicked. Check out more about the Create from Template macro. You can organize the information you need on your index page however you wish, but these design ideas should get you going in the right direction. Just remember, you have control of the parameters of these macros and you can create good looking pages and powerful reports. Happy creating! 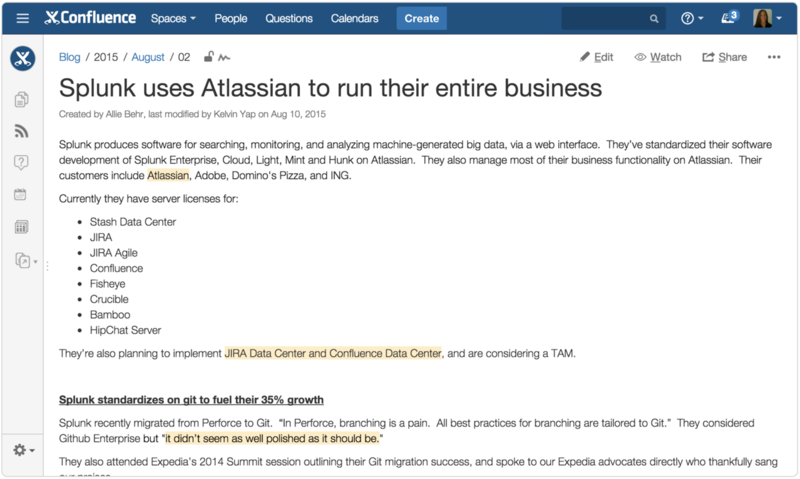 Example shared blog post: "Splunk uses Atlassian to run their entire business"
At a glance: what did you just learn? Creating a customer interview page—and an index page to organize and centralize all your customer interviews—will help you to both communicate customer feedback to your team and organization and turn interview information into insights about your products. Remember to experiment with you pages to make them work best for your process. Table of Contents macro: create a list of heading links for quick navigation. Panel macro: helps organize information by creating a container. Creating a template: pages used again and again can be turned into templates. Adding labels: labeling pages does two things: organize information and help macros do their magic. Creating a space: a dedicated customer interview space is a good idea for any team. Creating an index page: make the home page of your space an index page for quick reference. Livesearch macro: add search to help quickly locate customer interviews. Create from Template macro: add a button to open a new page with the template you created from your page. Labels List macro: create a quick reference list from the labels you attach to pages. Content by Label macro: use this to create a list of all customer interviews. 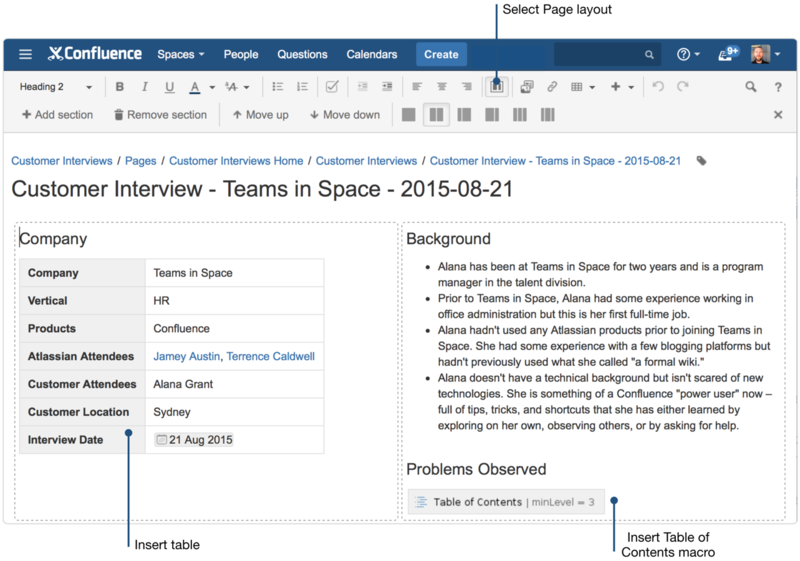 This post is part of our latest collection, A Software Team’s Guide to Confluence. Click the lovely green button below to see more. Download the Software Team’s Guide to Confluence ebook to see all our tips in one place, then watch the blogs in this space to get notified when new tips articles like this are posted. And if that's not enough, sign up for Confluence Insiders – our monthly newsletter covering all things Confluence. Loved this page? Share it on Twitter!